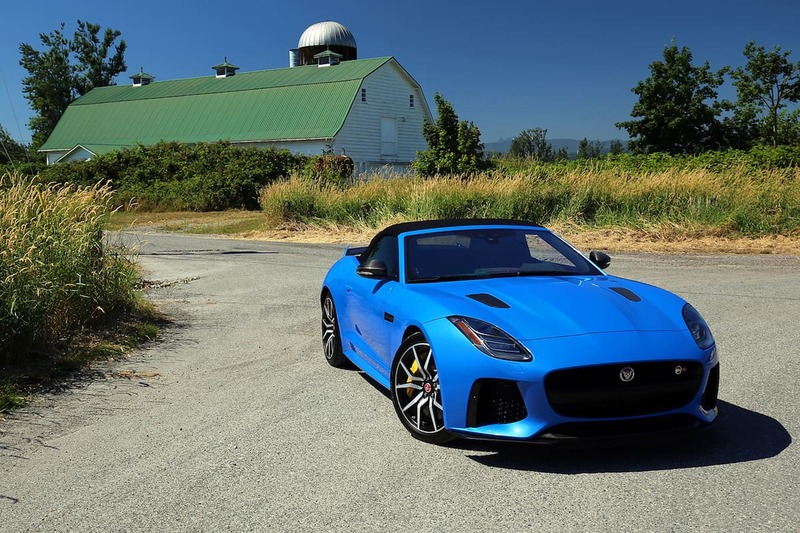 Jaguar revamped their image when they rolled the stunning F-Type convertible and coupe into showrooms back in 2013, a dynamic duo that represented the company’s first real sports car design in over four decades. For 2018 Jaguar has pushed the F-Type performance envelope into the stratosphere by unleashing the F-Type SVR. 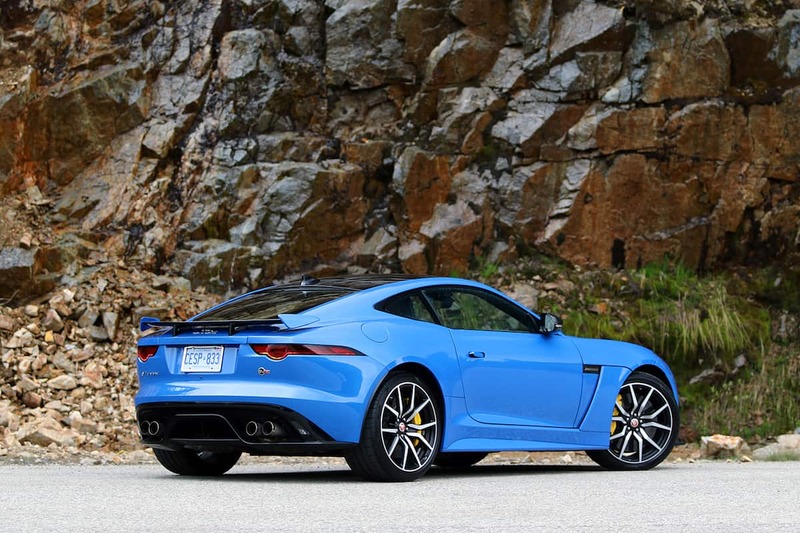 Much like its lesser F-Type siblings the SVR is available in both coupe and convertible form. There is just one engine choice, but it’s a very special one- a supercharged 5.0-litre V8 engine that produces a prodigious 575-horsepower and tire shredding 516 lb.-ft of torque. An eight-speed quick-shift ZF transmission incorporates a Sport mode which can be operated by using extra long, steering-wheel mounted aluminum shift paddles. The latter proved quick to react and allow the driver to maintain their focus while exploring the razor-sharp handling of this special machine. 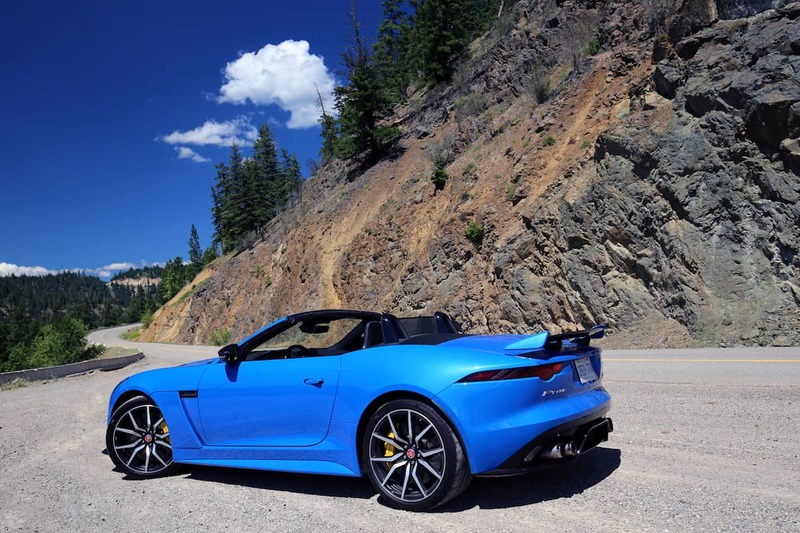 The F-Type SVR utilizes Jaguar’s Intelligent All-Wheel-Drive system to ensure that power is delivered efficiently to all four wheels and to maximize traction and enhance stability. I initially thought that this system robbed the car of some of the playfulness usually exhibited by the brand’s traditional rear-wheel-drive platforms, but after spending some time exploring the twists, dips and turns of some glorious country roads in both cars, I came to appreciate how stable and surefooted the SVR package is. Enthusiast drivers will appreciate that it still has a rear bias, as power delivery is split 63% rearward and 37% forward, and the car is almost perfectly balanced. 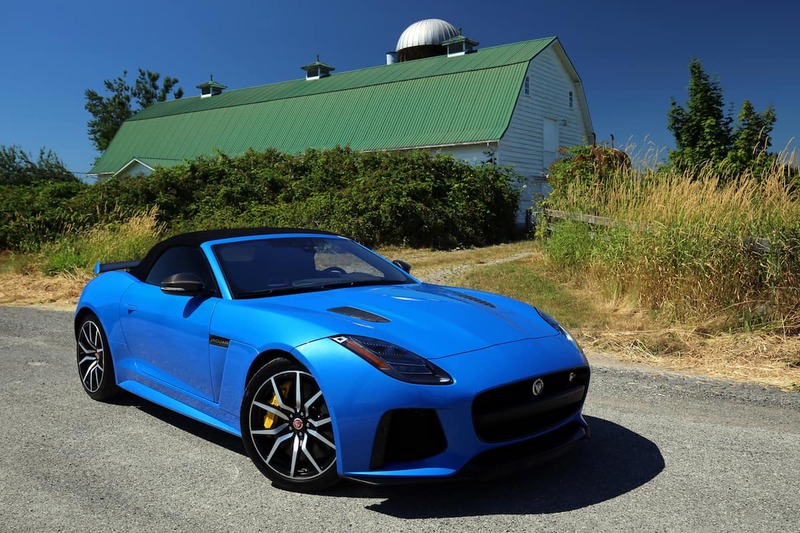 SVR is Jaguar’s in-house high-performance division (Special Vehicle Operations) and cars given this designation represent the top-tier offerings for the brand. The F-Type is the first model to receive the SVR treatment and signals the Jaguar brand’s move to reclaim its status as one of the premiere performance brands, rather than just a maker of fine, luxury automobiles. Either variant of the Jaguar F-Type SVR Coupe will sprint to 100 kilometres-per-hour in a mere 3.7 seconds, and both cars are capable of reaching terminal speeds in excess of 300 kilometres-per-hour. The SVR convertible tops out at 314 km/h, while the slightly slipperier coupe will max out at 322 km/h, putting both cars in a pretty exclusive club. Jaguar’s design team has retained the classic long hood, short tail design that has become a signature for the company’s sporting machines, and the end result is both graceful and loaded with curb appeal. The F-Type SVR looks quick even when at rest, as the car has an aggressive stance, wide track, and bodywork carefully sculpted in the wind tunnel. Aerodynamic efficiency was a priority for this car, so it features a full complement of enhancements to the bodywork and ducting to help it slice through the air and stick to the ground. The most notable feature is an active carbon fibre rear wing which reduces both drag and lift, but the car is also equipped with carbon splitters front and rear. Track science also brings a smooth front underfloor and rear venturi to further reduce drag and direct airflow where it can be used most effectively. Illumination detail is handled by advanced LED lighting systems front and rear, giving the car the modern, edgy presence now shared by the entire Jaguar lineup. When you want to go fast, weight is an anchor, so the design team at SVO designed the F-Type SVR to be as light as possible. Substantial weight was shaved from the car in several key areas, including the exhaust system, suspension, and wheels. In the case of the latter, the 20-inch forged alloy wheels fitted to the SVR provide a 13.6-kilogram advantage when compared to the standard F-Type wheel. For those looking for even larger gains, and superior stopping performance, the car can be ordered with the optional Carbon Ceramic Matrix Braking system, which saves a further 20.8 kilograms. Remember, each-and-every kilogram saved helps the SVR meet its performance objectives – more rapid acceleration, more agile handling and sharper braking. The SVR launches with the perfect mix of aggression and poise. When you step hard on the accelerator the long nose gently rises and the car sets back on its wide haunches, before quickly levelling off as you ease up on the pedal once you reach your desired speed. Torque is abundant at all times as the car’s sophisticated boost control system works to maintain power levels over a broad range of engine speeds. Unlike a turbocharged car, there is no lag, and as a driver you will be confident that the SVR always has enough power on tap to deal with any situation. With more power many sporting machines struggle with traction issues, so the SVR wears a wider, more aggressive Pirelli tire than its lesser siblings, and the P Zero was sticky enough to help the car track straight and true, even over damp surfaces. The car also features Torque Vectoring Torque Vectoring in the F‑TYPE maximizes capability through even the tightest corners. Torque Vectoring technology which provides controlled independent braking of the inside front and rear wheels to facilitate turning manoeuvres. Unlike a turbocharged car, there is no lag, and as a driver you will be confident that the SVR always has enough power on tap to deal with any situation. One can’t forget that Jaguar is also a luxury brand, so consumers expect a high level of refinement in all of their products, even the ultra-high-performance ones. The engineers have succeeded, as the SVR engine, drivetrain and suspension package performs with a level of seamless smoothness that puts many higher dollar platforms to shame. In fact, the F-Type SVR in either flavour represents one of the most dynamic handling and responsive automobiles on the road today, at any price. When operating the car in Dynamic mode it really comes alive, as the advanced sport suspension firms up the ride giving the driver a better feel as to what the car is doing through both the seat and controls. When left in drive mode, the “QuickShift” gearbox strives to select shift geared for fuel efficiency rather than fun extraction, but when the driver elects to select his or her own shift points it becomes easy to explore the car’s true performance potential. The car exhibits just a hint of under steer when you hustle it through tight radius twits and turns, but for the most part, the car tracks straight and true. While putting both versions through their paces on some of British Columbia’s most sinister roads, the cars never felt unsettled, but buyers of SVR models will need to pay extra close attention to their driving to stay out of trouble, especially due to the car’s penchant for attaining almost effortless speed. Luckily my test units both came equipped with the exceptional carbon ceramic brake upgrade. All Jaguar F-Type models are fitted with an Active Sports Exhaust which reacts to throttle position, speed and engine revs by opening active valves. The unit on SVR models is constructed of a combination of titanium and Inconel superalloy and produces a symphony of growls so glorious that you will find yourself looking for tunnels and alley ways to best exploit the engine note and rattle your senses. The sounds that are emitted by this car are so pronounced, that they still play over-and-over on a regular basis in my memory banks. Sliding into the cockpit reveals that the styling of the car’s cabin is classy, not garish. The look and layout of the dash is uncluttered and free of extraneous switchgear and adornments. After all, this is a driver’s car, so all controls and switchgear are strategically placed and remain highly visible, and most become intuitive to use in short order. The level of fit-and-finish throughout the interior is impressive. The performance sport bucket seats are wrapped in fine leather further enhanced with a diamond pattern, as are the door inserts, and in the case of my Ultra Blue testers, bright blue stitching. The seats themselves are equally adept at holding you securely in place when you are driving at the limit as they are at providing enough comfort to accommodate long distance cruising. I stand six-foot-two inches tall, and found more than enough head-, leg- and hip-room in both coupe and convertible. However, the convertible offers less cargo capacity due to the fact that the folding roof needs a home when retracted. The list of standard features for this car is extensive and includes Incontrol Touch Pro (an advanced connectivity and entertainment platform), Navigation Pro, electric power assisted steering, and a high-powered Meridian audio system. Popular upgrades include carbon ceramic brakes and a plethora of carbon fibre trim pieces. If I had an SVR in my driveway I suspect that it would be very difficult to get hold of me and many of my daily tasks, work responsibilities, and household chores would fall down the priority list. Luckily, for both my career and relationships, I only had this problem for a period of two weeks, but the SVR really is a car that is so special and intoxicating that it will beg for the undivided attention of its owner.